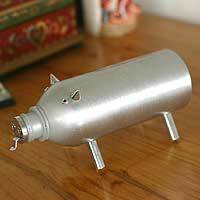 Recycling discarded objects as art, Luitpol depicts a cheerful pig. 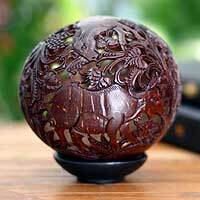 The body is fashioned from a bottle, and pointy ears and slender legs complete the whimsical figurine. The nose unscrews. Squealing with excitement, a little pig seems to want to play. The image from Eka is charming. 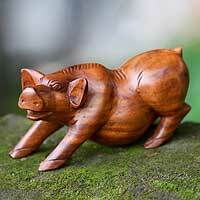 Masterfully carved from Balinese suar wood, this realistic portrait of a pot-bellied pig is filled with personality. 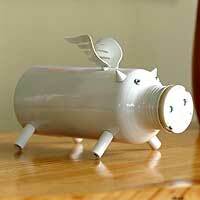 Recycling discarded objects as art, Luitpol depicts a cheerful white pig. The body is fashioned from a bottle and wears wings. 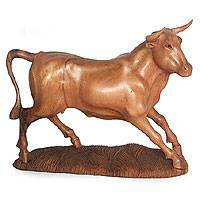 Pointy ears, a curly tail and slender legs complete the whimsical figurine. The nose unscrews.